Here is just a quick look some more cost of living stuff. 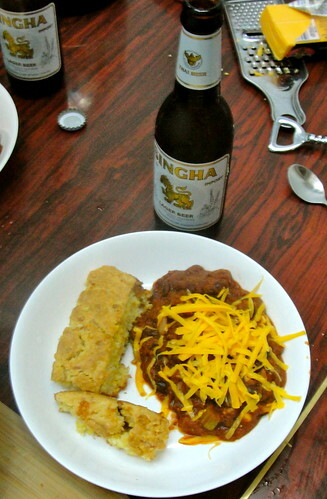 This past Sunday I made Vegetarian Chili and corn bread from scratch at our apartment. 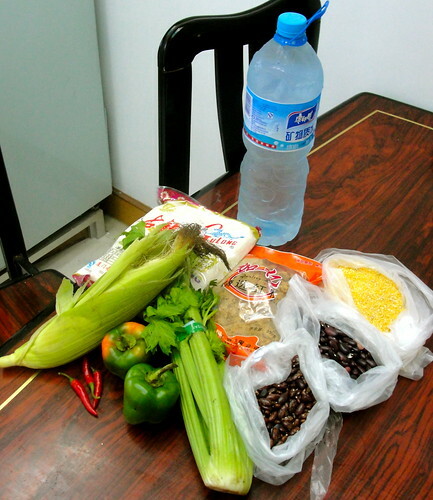 I didn't have most of the fresh stuff I needed, so I ran across the street to the market to pick up some things. How much did all this cost me? 19.00 RMB that is just above $2.75. Yes I cheated a bit by using real (not powdered) milk, along with cheese and butter from the Metro (not included) in the corn bread. Adding these almost triples the cost of the meal, since a good block of cheddar, milk, and butter can easily run you 50RMB (still only costing you $10, including the produce) but obviously you then have plenty left over for other stuff. I also cheated a little and bought canned tomato sauce for around 15 RMB, but this could easily be substituted for real tomatoes that cost about 1-2 RMB a piece. If you include the garlic we had in the house, this yielded enough Chili and Cornbread for 4 people to eat until they were stuffed. Oh, and it came out great BTW. Don't want to go back ! ahaha. Hope I can see you again.